SCVHistory.com LW3288 | Lebec | Plane Crash Kills All 8, 1-29-1932; Future Sheriff Biscailuz, Future Gen. Hap Arnold Direct Weeklong Search. With the pilot dead at the controls and the bodies of seven men and women who rode with him to death still in their seats, the burned wreck of the lost Century Pacific plane was found tonight in the mountains near Lebec. It lay among the trees of a snow-covered canyon side, four and one half miles west of Fort Tejon; only a little way below the summit of the last ridge that pilot J.V. Sandblom would have had to clear to bring him into the safety of San Joaquin Valley. Photo shows the wrecked airliner with the broken and horribly charred bodies of its cargo of human beings huddled in a gruesome mass in and near the remnants of its cabin. Los Angeles Times, February 5, 1932. Click to enlarge. 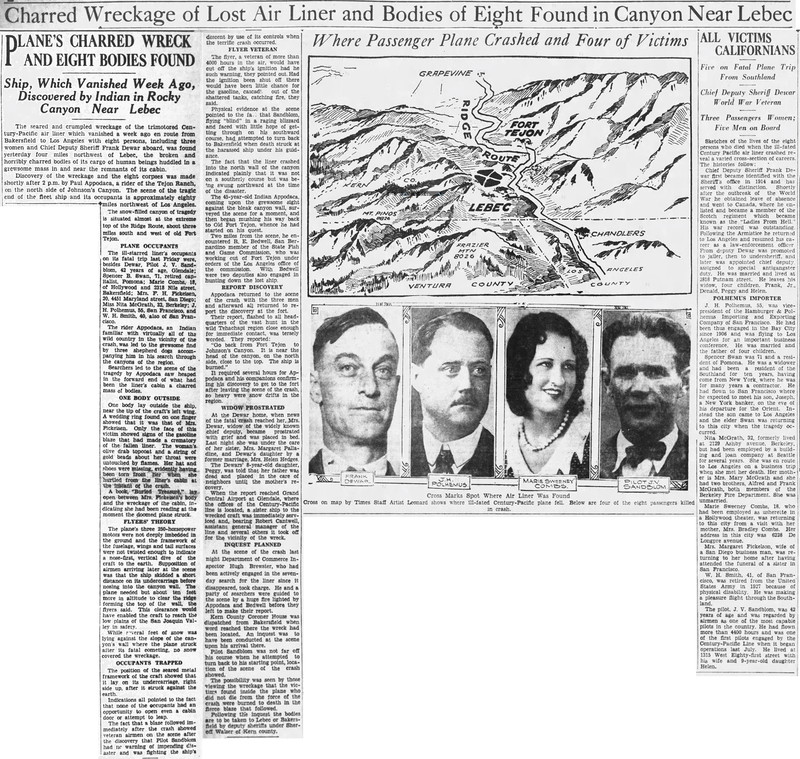 Snow and near-zero visibility stymied the biggest rescue and recovery operation of its kind ever undertaken after a commercial airliner carrying the pilot and seven passengers went down in the mountains between Lebec and Fort Tejon, just west of the Ridge Route (future Interstate 5 in this area), on Friday afternoon, January 29, 1932. The crash came in the middle of the harshest winter in recorded history. 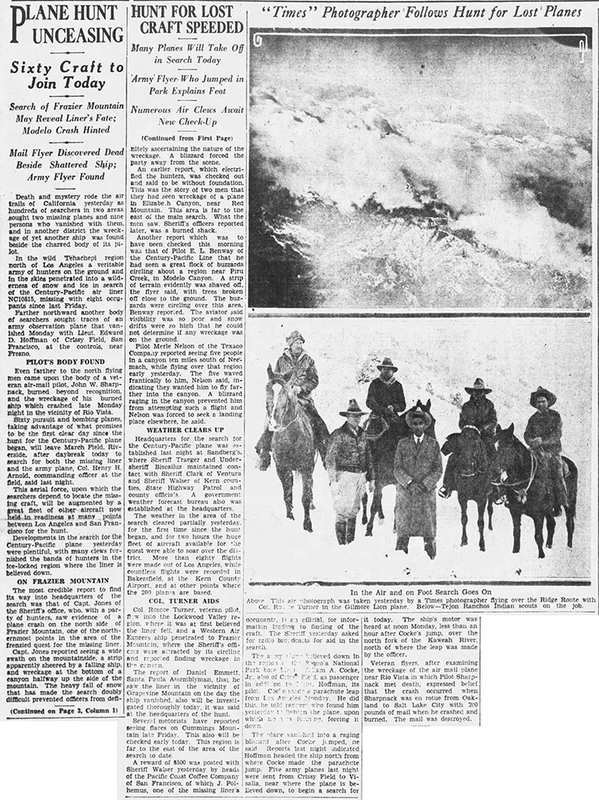 The first storm of the season dumped at least 10 inches of snow on the Ridge Route in December 1931; even Hollywood got snow on January 15. Throughout much of the weeklong search for the downed craft, 150-200 airplanes, both military and civilian, were grounded at Los Angeles, Bakersfield and Tejon as the storm dumped a foot of snow in a single day and kept coming. Military planes were under command of the coronel in charge at March Field in Riverside — Henry H. "Hap" Arnold, future 5-star general and commander of the U.S. Air Force. An equally massive ground search was organized by future Los Angeles County Sheriff (then Undersheriff) Eugene Biscailuz, who ran the operation from Sandberg, aka Sandberg's, on the Ridge Route. The U.S. Weather Bureau (now called National Weather Service) set up a weather station there to monitor the storm — which is why there is a weather station at Sandberg today. Eyewitnesses from Camarillo on the west to Lake Elizabeth on the east reported seeing "something." Distances and directions being difficult to judge from the ground, especially in inclement weather, the initial search area spanned more than 8,000 square miles. (By comparison, L.A. City is 503 square miles.) "Clews" (see below) from eyewitnesses led authorities to concentrate first in the Sespe area of Ventura County and in Lockwood Valley, several miles west of Frazier Park. Miners on Frazier Mountain and some tourists had seen a plane in trouble in the Lebec-Tejon area, and Pablo Paul J. 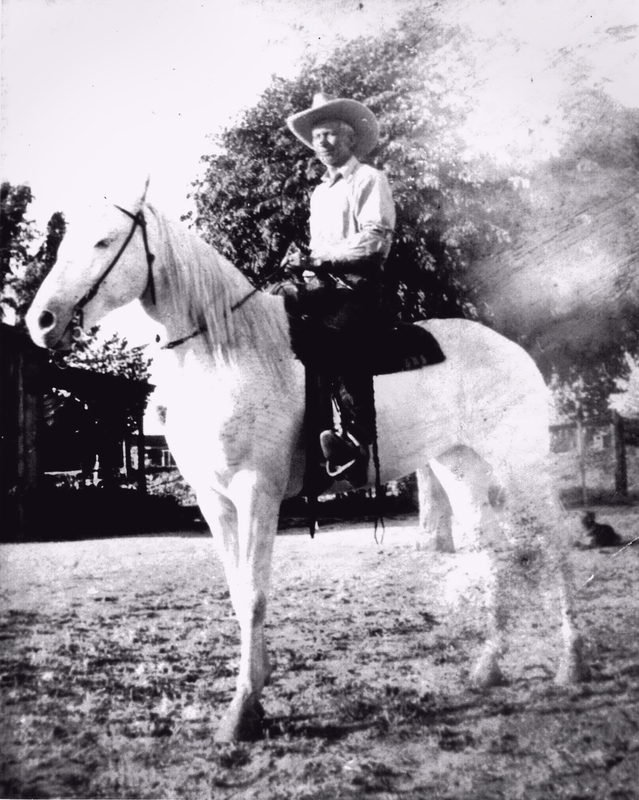 "Pablito" Appodaca (1887-1969), an Indian vaquero on the Tejon Ranch, actually saw the plane go down and found the crash site. But the weather delayed their communications by five days. By that time, all hope of finding survivors had been abandoned. Anyone who might have survived the crash would have frozen to death. Paul "Pablito" Appodaca: Led searchers to crash site. Click to enlarge. Joseph Victor Sandblom was a veteran pilot with more than 4,400 hours of flying time. Born November 20, 1890, in Sweden, he immigrated to the United States with his parents in 1899 and lived in New York where he was naturalized in 1911. By 1920 he was living on Trolley Way in Venice, Calif., with his wife, Helen Agnes (Durer), whom he married in 1917. Their daughter, Helen Audrene, came along in 1922. By 1930 they had moved to the south side of the marina at 1315 W. 81st St., Los Angeles (now Playa del Rey). The 42-year-old pilot was making the return run home from San Francisco to Grand Central Airport in Glendale by way of Bakersfield, where he picked up two passengers of whom one was Frank Dewar, a high-ranking L.A. County Sheriff's official in charge of the anti-gangster unit. Dewar had been in Buttowillow, following a lead on some fugitives from the Zeke Caress kidnapping case (see below). 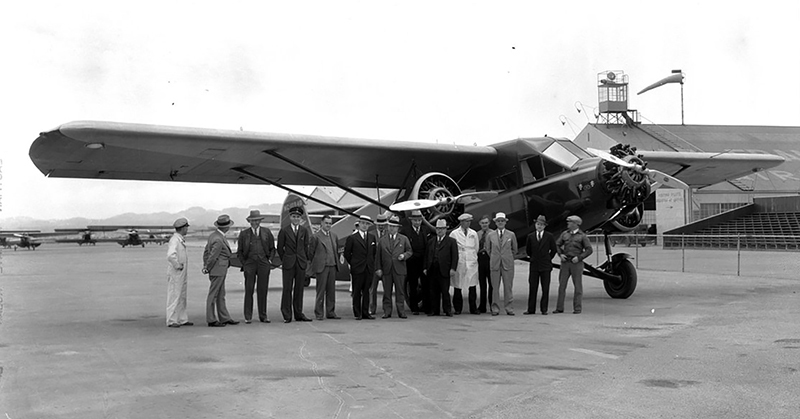 Sandblom was piloting a 10-passenger Stinson Model T (SM-6000-B trimotor with three 250-hp engines), NC-10813, for Century-Pacific Lines when he encountered unsafe flying conditions in the Tehachapi Mountains and tried to turn back to Bakersfield. Pilot Sandblom's draft card, June 5, 1917. Click to enlarge. Flying blind, he might have been hoping to land on the plain north of Tejon when his craft skimmed the tops of trees, bounced and impacted just 10 feet shy of clearing a ridgeline. His plane burst into flames — the location of the fireball confusing eyewitnesses far and wide. All eight persons died instantly in the crash or nearly so in the fire. * Spencer W. Swan, 71, a charter member of the Pomona Elks Club and onetime industrialist in New York. He was hurrying home to Los Angeles after flying to San Francisco to see his son off to China. His son wasn't there. He was en route to Los Angeles to see his father. Ships in the night. Swan could have stayed home. * J.H. Polhemus, 55, vice-president of Hamberger Polhemus Co., an import-export firm in San Francisco that owned the Pacific Coast Coffee Co. He had a business meeting in L.A. Married, four children. * W.H. Smith, 41, of San Francisco. A disabled U.S. Army veteran, he was taking a pleasure trip around the Southland. * Nita McGrath, 32, of Berkeley, unmarried. Formerly employed by a building and loan company in Seattle, she had business in Los Angeles. * Marie Sweeney Combs, 18, an usherette in a Hollywood theater — and presumably an aspiring actress, considering she lived at Gower Gulch (near the corner of Sunset Boulevard and Gower Street), where the "poverty row" movie studios were located. The daughter of a Bakersfield traffic officer, she had gone home to see her mother. Dewar left behind a widow and four children. Century-Pacific Lines Ltd. was barely six months old when the crash occurred. 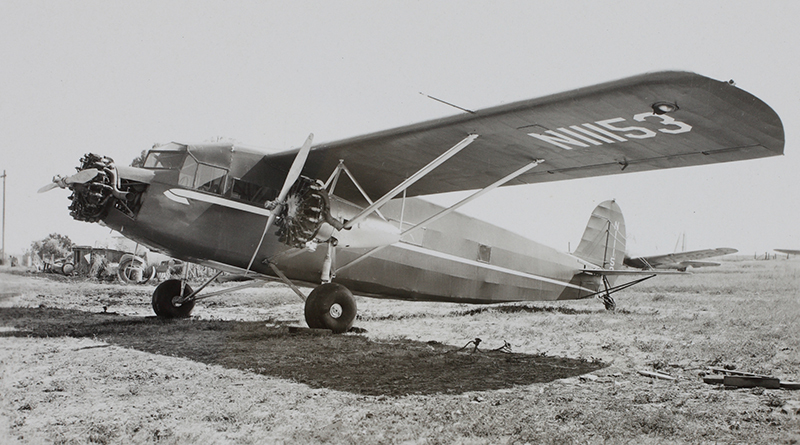 Century-Pacific and its sister company in Chicago, Century Airlines, were launched in 1931 by Errett Lobban "E.L." Cord (1894-1974) of Cord luxury automobile fame. The California airline was intended to compete with rail and bus lines. Thus its slogan, "It costs no more to fly." Originally a Midwesterner, E.L. Cord showed an early interest in automobiles — working on them, racing them, managing and then owning the Auburn Automobile Co. (maker of Auburns and Cords). An adept capitalist, he started buying up shares in other companies until ultimately his holding company, Cord Corp., owned a controlling interest in 150 different companies, mostly in the transportation field. One of them was Stinson Aircraft Co.; so, his two airlines flew only Stinson planes. 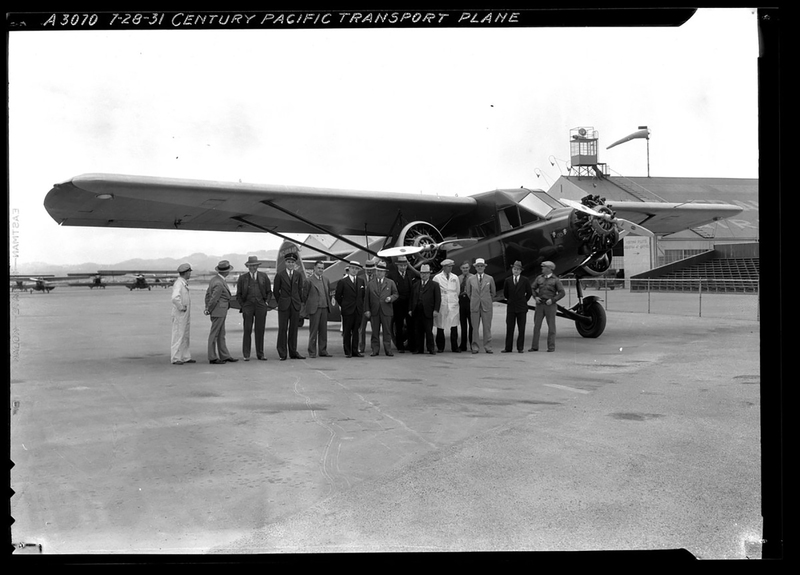 A Century-Pacific Stinson trimotor begins service at San Francisco Airport, July 28, 1931. Click to enlarge. Cord appointed O.R. "Ollie" Fuller to run Century-Pacific Lines. Fuller had been the Auburn dealer in Los Angeles and a major bus line owner until he went bankrupt during the Depression. These were desperate times, and Century-Pacific was a budget airline. Cord made his pilots work long hours and rewarded them with pay cuts. They went on strike in Chicago, and the treatment of pilots in L.A. (and of workers at Cord's car manufacturing plant and dealerships) created an insurmountable rift between Cord and Fuller. Cord pushed him out. Fuller retired to his family's 3,000-acre ranch near Corona. Meanwhile the fledgling American Airlines (est. 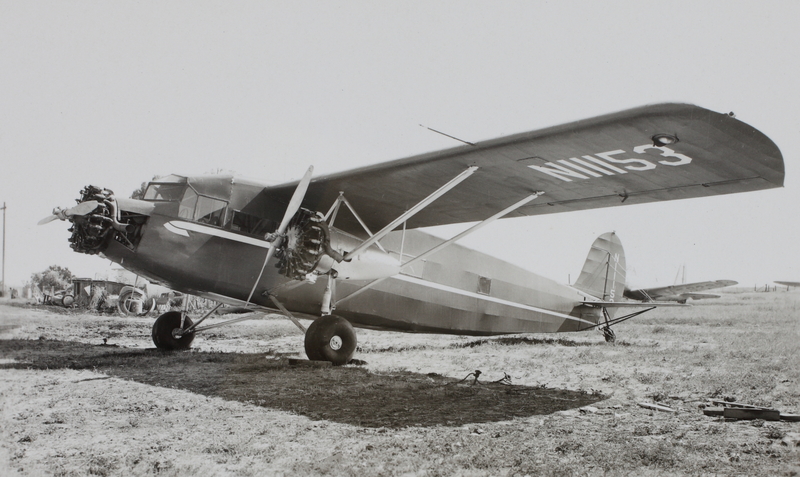 1930) took advantage of the poor labor relations and initiated a hostile takeover of Cord's two airlines. Unknown to the board of American's holding company, Cord was secretly buying up its shares, and by the time the deal was done, Cord controlled both Century and American Airlines. He was well on his way to becoming a major real-estate and media mogul in California and Nevada. As for Stinson Model T's in general, ten SM-6000 trimotors crashed between 1931 and 1936 in the United States and abroad. Of those, the Lebec crash was second-deadliest. 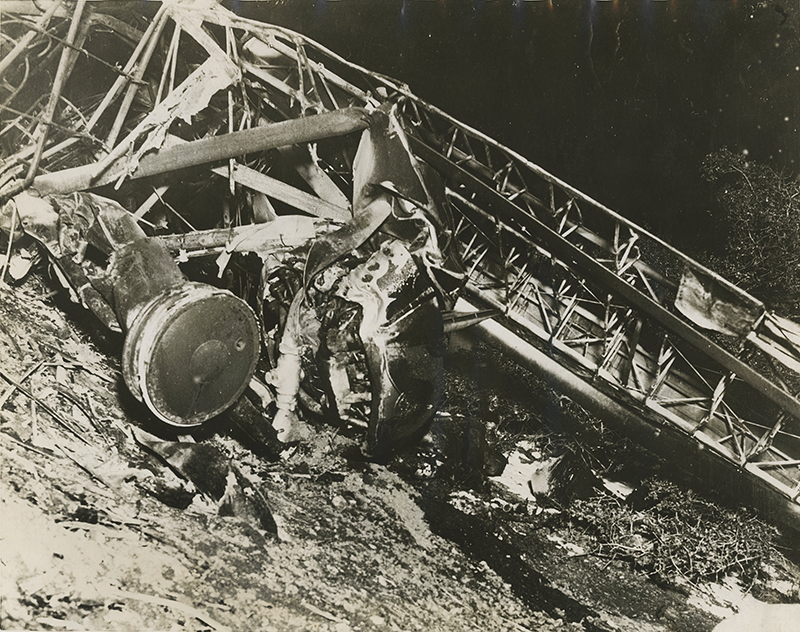 Ten people were killed (and one survived) shortly after takeoff in Pittsburgh in 1936 when all three engines failed. Federal authorities determined that a passenger sitting in the cockpit accidentally switched off the fuel selector valve with her heel. About the Zeke Caress Kidnapping. Known as the "King of the Bookies," Ezekiel Logan "Zeke" Caress (1881-1968) owned ex-prizefighter James Jeffries' old gin joint at 326 S. Spring St. in Los Angeles (which Jeffries sold in 1918 when he started manufacturing dynamite in Saugus), as well as the Agua Caliente casino and racetrack in Mexico. In December 1930, Caress and his wife and their Japanese servant were kidnapped and held for ransom by rival mobsters with ties to Al Capone. The payoff was botched, the Caresses were freed, and District Attorney Burton Fitts thought the whole episode was a ruse for control of the offshore gambling ships, which he cracked down on. Related trials went on for a couple of years. Another example of a Stinson SM-6000-B. Photo: San Diego Air and Space Museum. Click to enlarge. In the transcripts below, place-names are generally unchanged (e.g., various spellings of "Tehachapi"), while people's names have mostly been corrected (e.g., the victims). In some respects but not all, The Los Angeles Times followed the lead of the Simplified Spelling Board, established in 1906 by Andrew Carnegie and championed (unsuccessfully) by President Theodore Roosevelt, ostensibly to make English spelling easier to learn and more "American." Thus The Times gives us "clew" for "clue" and "grewsome" for "gruesome." Just as American writers in the 1700s changed certain words ("honor" for "honour"), Carnegie and fans such as Mark Twain sought additional reforms. Most of their suggestions were not formally adopted (e.g., "tho" for "though," "wisht" for "wished," "hos" for "hoes"), although some are still with us — e.g., "catalog," "analog," one "l" in place of two ("canceled") and the elimination of ligatures (the "ae" in "encyclopædia"). Sources, in addition to contemporary news reports (partial list): Coachbuilt.com/Mark Theobald (Cord-Fuller information), Cloverfield.org and GrandCentralAirTerminal.org/Delta Mike Airfield, Inc. (Sandblom and Stinson aircraft information), author J.H. Graham/jhgraham.com (Caress information), FlySFO.com/San Francisco International Airport, Bureau of Aircraft Accident Archives, Ancestry.com contributors. Century-Pacific Liner Unseen Since Leaving Bakersfield Port at 3:50 p.m. Overdue many hours and apparently lost in the mountain and desert country between Bakersfield and Los Angeles late yesterday, a tri-motored skyliner of Century Pacific Airlines with three women and five men aboard will at dawn today become the center of an intensive search by air and land. The ship, southbound from San Francisco, disappeared on a flight that started from Kern County Airport at Bakersfield at 3:50 p.m. yesterday and was scheduled to end at Grand Central Air Terminal at Glendale an hour later. Frank Dewar. chief deputy sheriff of the Los Angeles County Sheriff's office. Pilot J.V. Sandblom [cq], 1315 West Eighty-first street. S.B. Swan, Elks' Club, Pomona. Marie Combs, 2318 Nile street, Bakersfield. Mrs. F.H. Fickeisen [cq], 4451 Maryland street, San Diego. W.H. Smith, 150 Herman street, San Francisco. J.H. Polhemus, 149 California street, San Francisco. Dewar was returning from Bakersfield after searching a ranch near there in search of two fugitives wanted in the Zeke Caress kidnaping case. Pilot Sandblom, in complete charge of the ship, was making his regular run, a schedule on the air transportation network operated through Southern California and Western Arizona by Century-Pacific. The only clew in the disappearance of the ship was a report from Frazier Mountain store, near Lebec, on the Ridge Route, that a plane was heard overhead about the time the skyliner should have passed on its way southward. At least four other transport planes, however, traversed approximately the same route about the same time, and it was pointed out by flyers that persons at the store could have heard one of the other craft. Capt. William Bright, head of the Sheriff s homicide squad, ordered all his men to be prepared at dawn to strike out into the mountain territory in an effort to locate the ship. Century-Pacific planes and those of other airlines and private operators are scheduled to take off at daybreak to comb the entire route from the air. Terrific winds and clouds were encountered over the Bakersfield-Los Angeles skyway late yesterday by pilots of other air transports. It was believed by Sandblom's companion pilots that the Stinson ten-passenger cabin monoplane may not have pulled through safely the 6,000 feet of fog reported above Bakersfield. If the pilot did not get above the top of the clouds they said he would have been buffeted by winds which were charted to have reached a maximum of 112 miles an hour at high altitudes. John Johnson, United Airlines pilot, who landed at United Airport, Burbank, in a trimotored Ford from San Francisco at 6 p.m., said he was pushed by a sixty-mile-an-hour tall wind over the Ridge Route. This flyer declared Bakersfield was entirely overcast, but that the clouds broke up a bit over Taft and later over the emergency landing field in Antelope Valley, about halfway between Bakersfield and the Glendale port. The higher peaks on the Ridge Route — Frazier Mountain and Mt. Pinos — protruded through the cloud banks, but most of the valleys and canyons were filled with fog, he pointed out. From accounts of other pilots who flew southward about the same time — P.B. Denke, flying a second San Francisco-to-Los Angeles plane of Century-Pacific; George Rice of Transcontinental and Western Air, Inc., and Jesse Hart of Varney Speed Lanes, piloting ships from San Francisco — it was revealed that winds and clouds over the Ridge Route late yesterday were the worst that some of the pilots had encountered. They believed Sandblom may have gotten part way toward Los Angeles and then attempted to turn back. In that case, they pointed out, he would have had the terrific winds on the nose of his ship instead of riding them as speed aids coming south. Although no statement was forthcoming from the operations office of Century-Pacific, it is estimated by traffic representatives the lost plane had fuel enough to last three hours and forty minutes. As the minutes elapsed last night and the deadline of time that the place could have remained in the air passed, directors of the air line were convinced the lane had been forced down. Where, they pointed out, was a matter of conjecture, as the pilot may have been blown far off his course by the high winds and attempted to land la the desert to the east of Palmdale. In that case it was possible no one in the ship would be able to reach a telephone before morning. This was the only hope held last night for the ship landing without major damage, for flyers declared a forced landing in clouds in the Ridge Route district could produce nothing less than a serious accident. Powered by three 250-horsepower engines, the Stinon transport had accommodations for ten passengers and one pilot. Hope that any of the eight occupants of the Century-Pacific air liner, which disappeared Friday after taking off at Bakersfield for Los Angeles may still be alive wherever the ship is down, was abandoned last night by searchers combing the mountainous region over which it started its flight. Even though the men making up the greatest searching party of its kind in the West's history abandoned hope of finding the five men and three women alive, the search went on through the night. Daybreak today will witness the greatest armada of planes ever to fly over California soil, winging areas north of Santa Paula, the region to which the search moved late yesterday after coinciding reports indicated the ship was lost while flying a course more westerly than at first supposed. More than 200 airplanes are expected to fill the skies this morning, army, navy, commercial and privately owned ships leaving Los Angeles and Bakersfield for the great hunt. Twenty bombardment, observation and pursuit planes from March Field, Riverside; ten naval planes from Long Beach, a similar number of observation planes of the California National Guard; ten ships from the naval base at San Diego and planes of many commercial firms will make up the huge fleet that will take up the search. Undersheriff Biscailuz acted as spokesman for the bands of police officers, ranchers and mounted men searching for the ship on the ground. "We'll keep on looking," Biscailuz said. "There cannot be any chance for them now. Even though they might have survived a crash of the ship they could not live in this weather. But we are not going to stop hunting until we have found them." Biting cold in the mountainous region, the elements yesterday seemed conspiring against a successful termination of the search. Rain, fog and a ceiling so low that planes were useless, resisted efforts of the searchers. Observation from ships was impossible, and ground searchers shuffled through deep snow in their hunt. Officials of Century-Pacific last night said reports from the vicinity a short distance north of Santa Paula, far to the westward of the region where the ship was at first sought, caused a shift in the searching parties' scenes. Reports trickling out of the wilderness indicated the ship, battling futilely against high winds and low ceiling, passed over the region north of Santa Paula, the officials said. One report was particularly convincing and resulted in ten patrols being rushed to that region. This came from a 15-year-old boy and his mother, ranchers at the south end of Lockwood Valley. The mother, Mrs. Fred Tifft, and the youth. Freddie Tifft, said they saw and heard a green-and-gold plane pass overhead, then hoard its motor falter and die. The lad said he saw the lights of the plane turned on as it passed over his home. This was at about 6 p.m. Friday, the boy said. Searchers dispatched to the scene of the ship's disappearance from the view of the mother and son said the country was impenetrable afoot and plans were made for a mounted searching party to comb it this morning. Several ships in the group of searching planes narrowly escaped crackups at Lebec late yesterday, due to insufficient landing space at the field there and the base for the aerial searchers was transferred to Tejon, north of that city, where the air force of searchers will base during the remainder of the hunt. Telephone service between searching parties last night was maintained by forest rangers, who rigged up emergency lines of communication over the vast area. Acting Commander Hunter of March Field last night said he will send out a score of ships this morning without authorization from Washington, but that in order to keep the planes in the field more than a day he will have to obtain this authorization. The order is said to be on its way from the Secretary of War's office at Washington. Heads of the searching party in the region where the ship is believed to have fallen said they must rush their search today to take advantage of what promises to be clear weather. Clouds over the region last night will be gone today, it is predicted. Report that he had heard the roar of airplane motors in a heavy fog followed by a crash Friday afternoon about 4:30 o'clock as he was crossing Conejo Pass on Ventura Boulevard near Camarillo, was made to the North Hollywood police last night by George Cropp, 10839 Hesby street, North Hollywood. Cropp told Sergt. Newstead he had heard an airplane crash once before and that the noise Friday was similar. He told the police it was foggy and that he was unable to see the plane, but that it apparently passed above his head and that the noise of the crash came to him from some distance south in the Santa Monica Mountains. "The area to be covered in the search for the Century-Pacific air liner is in the neighborhood of 8,085 square miles. It is a tremendous project and an extremely difficult task, but enough airplanes have been assembled to attempt complete coverage of this vast expanse Sunday, officials of the airline said last night. At the same time the Sheriff's office received a telephone communication from Undersheriff Biscailuz at Lebec asking that men held in reserve by the police department and Sheriff's office be sent home with instructions to be in readiness for a concentrated search today. One of the several similar locality reports which caused the army of searchers to turn toward the Santa Paula area was telephoned by Claud Peters, special agent for the Southern California Telephone Company, who informed Sheriff's officers at Lebec that new information had come to him and at least four persons had reported seeing a plane in distress in the Sespe district late Friday afternoon. The approximate location was fixed at about four miles north of Wheeler Hot Springs, near Ojai. This information fitted in with earlier reports that an aviator had seen in the Sespe Canyon what he believed to be a shack burning late Friday. To investigate four airplanes were dispatched from a temporary field at Lebec. From executive of the airline it was determined that the ten-passenger ship had gasoline only for three hours' living when it left Bakersfield at 3:50 p.m. Friday. The lapse of time also dimmed the hope that Pilot J.V. Sandblom could have set the air liner down on an emergency flying field or remote spot in desert or canyon. Battling forbidding elements that made flying gravely dangerous, private, police, industrial and naval planes joined in the search yesterday, with the pilots at the risk of their lives swooping down remote mountain canyons of the Tehachapi Mountains in the hope of catching sight of the missing air liner. On the ground the same struggle against the elements was in progress. From cities and towns men on horseback, on foot and in automobiles joined the search until it was estimated that upward of 500 men were actually hunting for the lost ship, in many cases battling their way through heavy snow that shrouded the upper ranges. From Los Angeles, Bakersfield, Glendale, Long Beach, San Diego, Santa Paula and many smaller neighboring communities came men and planes to join in the search. As the day wore on reports were received from different points that might indicate a clew to the missing plane. Outstanding in these was a message telephoned to the Sheriff's office here by F.E. Sanford, 122 East One Hundred and Sixty-fifth street, Long Beach. Sanford said he and two other men had visited some oil leases near Fillmore Friday afternoon and were returning when they saw an airplane, apparently in distress, near a mountain about five miles north of Fillmore. Sanford said the plane disappeared back of the hills and did not reappear. Still another report came from the Southern Pacific Railroad offices. Early in the day T.H. Williams, assistant general manager, had relayed word to all train crews, station agents and other railroad workers on the northern division to keep an eye out for the missing air liner. Later in the morning word came from the station agent at Caliente, south of Bakersfield, that ranchers near Sycamore Canyon, twelve miles cast of Caliente, had heard the drone of plane motors about 5:20 p.m. Friday. The noise was said to have stopped suddenly. One of the earliest reports was that flares had been seen during the night along the ridges of the Tehachapi Mountains. Later in the day, however, these lights were attributed to power wires. Belief that a mysterious searchlight which was reported seen about 7 p.m. Friday by men employed at the Los Angeles Water and Power plant near Saugus may have been attached to the missing plane was indicated yesterday in a report to the Sheriff's office. The light first was believed to have been a newly installed beacon but investigation disclosed that it did not revolve. In the darkness it was difficult to determine the distance, the men declared, but it was roughly estimated at perhaps twenty-five miles from the power plant in a northwesterly direction. Sheriff s deputies were assigned to investigate. Two chief centers for the search were organized. Ground search of the mountain area was under direct supervision of an impromptu committee formed at Lebec and whose members included Undersheriff Biscailuz, Capt. William Bright, head of the homicide squad of the same organization; Detective Lieutenant Miller, Los Angeles Police Department; H.B. Griffis, superintendent of the Kern county airport; William Young of the Century-Pacific Lines; and Hugh Brewster, aeronautical division of the United States Chamber of Commerce. Organization of the foot forces at Lebec included plans for camp equipment and food, which was rushed from Los Angeles and Bakersfield. At Bakersfield sixty men were recruited from the unemployment camp there and hurried into the mountains. In addition were many officers and volunteer searchers. The Bakersfield contingent was under the direction of Capt. Roy Galyen, head of the Kern county unit of the California Highway Patrol, and Hal B. Griffis [cq], Kern county superintendent of airports. Ready to augment those searching on foot, Chief of Police Steckel, at the request of Undersheriff Biscailuz, held in reserve a foot patrol of fifty Los Angeles policemen, who were ordered to go home and await a possible call for duty in the mountains. Early yesterday afternoon Chief of Police Weatherly of Culver City dispatched twenty American Legion members from Community Post. No. 46 to Lebec to reinforce Biscailuz's contingent. Co-operating with the foot forces also were scores of employees of the General Petroleum Company, who comprise a force that usually work on the oil company's oil pipe lines through the mountain district to Los Angeles. These men were instructed from the local offices to aid the searchers in every way possible. A pathetic note was added to the ranks of those who toiled slowly on foot over the ridges by the appearance among them of Frank Dewar's two sons, Frank Jr. and Donald, who still hope to find their father alive. Beside them in the search was Bradley Coombs, State motorcycle officer of Bakersfield, whose 18-year-old daughter Marie was also a passenger on the missing plane. The second search center was directed toward aerial activities and operated from Century-Pacific offices at the Grand Central Air Terminal, Glendale. Here most of the planes engaging in the search made a base and reported their findings. Checking back on weather reports officials at the airport are inclined to believe that Sandblom, forced lower and lower by the clouds, might have eventually headed toward clearer skies that would have taken him off his course toward Santa Paula. Three planes had landed at Lebec before afternoon yesterday despite the ragged weather. They were piloted by C.H. Lienesch of the aviation department of the Union Oil Company; George Rice, Transcontinental Western Air; and Mike Doolan, operating a Standard Oil Company plane. All the pilots reported a low ceiling and poor visibility. Although they had covered considerable territory before landing at Lebec they reported they saw nothing of the plane and much of the time were unable to see the ground at all. One of the first planes out was a Union Oil ship piloted by W.C. Carey, who took off from the Grand Central Air Terminal at 8 a.m. yesterday and returned at 2 p.m. He reported he had covered considerable territory but was hampered by the low celling. Frank Dewar, chief deputy sheriff of Los Angeles county. Mrs. P.H. Fickeisen, San Diego. 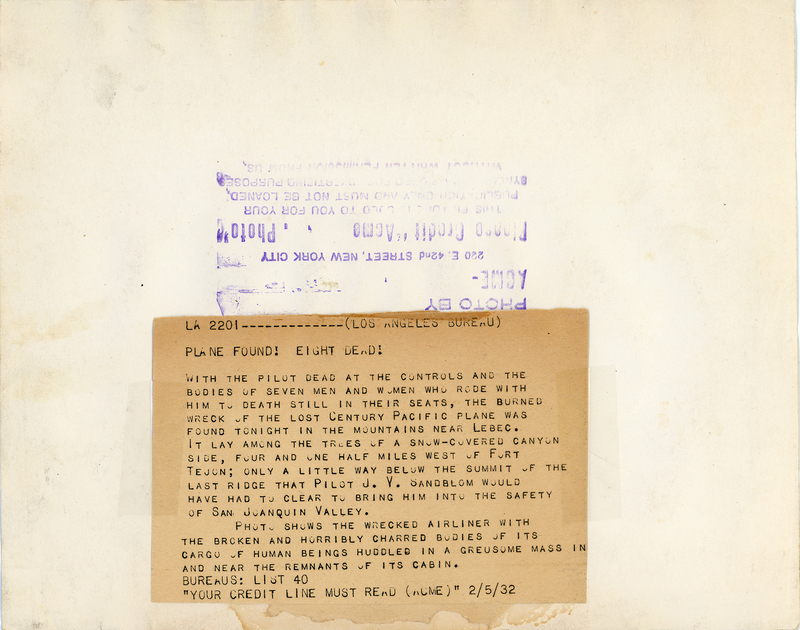 In addition to the activities at Glendale and Lebec, squads of officers and volunteer searchers were active at Palmdale, Lancaster and Mojave, on the theory that the pilot may have tried to make a landing in the desert. Los Angeles Times | Sunday, January 31, 1932. Those missing with the lost Century-Pacific air liner represent a cross-section of American life — all in varying ages of life. Chief Deputy Sheriff Dewar joined the Sheriff's office in 1914 and shortly after obtained leave to enlist with one of the Canadian regiments, becoming a member of the famous "Ladies from Hell," a kilted command. After the war with Spike Modie, veteran deputy, Dewar wrote a splendid record in the role of a peace officer. Dewar later became jailer, under-sheriff and chief deputy. He is 48 years of age and lives with his wife at 2818 Putnam street. He is the father of four children, two of whom are with the searching forces at Lebec. Marie Sweeney Combs, 18, a Hollywood usherette, was returning to the film capital for duty when distress overcame the airplane. She is the daughter of a Bakersfield traffic officer. Spencer Swan, 71, was hastening south from San Francisco after having bade farewell to a son about to sail for China. He is a widower and has resided for ten years at Pomona. Nita McGrath, 32, of Berkeley, formerly of Seattle, where she was a building and loan concern employee, was en route to Los Angeles on a business trip. Mrs. Margaret Fickeisen is the wife of a San Diego business man and was en route home after having attended the funeral of her sister, who died recently in San Francisco. J.H. Polhemus, 55, has been in the coffee-importing and exporting business in San Francisco since 1906. He is vice-president of Hamberger-Polhemus Company and was en route to Los Angeles to meet New York associates for a business conference. W.H. Smith of San Francisco left the northern city with the plane party on a pleasure trip. He is about 40 years of age and is a retired business man. J.V. Sandblom, 42, is the pilot of the aircraft. He has more than 4,400 solo hours of flying on his record. Pilot Sandblom is married and lives with his wife and child in Glendale. The wife has not been told he is missing with his ship, for she was discharged from a hospital only last Tuesday. Los Angeles Times | Monday, February 1, 1932. Fog, sleet and snow, the airman's most dreaded foes, conspired yesterday to defeat the search for the lost Century-Pacific airliner and its eight occupants missing since Friday, when it took off from Bakersfield to Los Angeles. The great hunt for the fallen ship and its human cargo centered last night in an area twenty-five miles square, covering a region of snow-capped mountain peaks and barren canyons. This district embraced high ridges formed by the Pine and Alamo Mountains, in an altitude more than 7,000 feet above sea level. The area, product of mathematical study by Sheriff's officers and veteran airmen, was decided upon after a simmering down of reports that have trickled in since the aircraft, and its eight occupants vanished from sight. Weather forecasts for today cast a shadow over efforts of the searching parties in the field. The forecast for today was: "Rain, with snow in the mountains." Promise of a fair day for the search was blasted early yesterday when show, rain and fog descended upon the area of the hunt. Only mountain men, equipped with skis and snowshoes, were able to continue the quest. More than 500 ground-searchers and 200 planes were available for the great hunt at dawn, but the weather prevented the aerial armada from taking off at Los Angeles, Bakersfield and Tejon, the bases, and held most of the earth-bound hunters from setting out. The region in which the fleet liner is believed to have fallen was fixed at a point about twenty miles south and west of Lebec. This area, due west of Sandberg and embracing the Topa-Topa Mountains, is only a short distance from where a small boy and his mother are reported to have heard the ill-fated ship crash. The lead furnished by the youth, a 15-year-old ranch lad named Freddie Tifft, and his mother, Mrs. Fred Tifft, was the only clew upon which the searchers fastened yesterday. The vast fleet of aircraft that was to have left Los Angeles yesterday morning, composed of army, navy, National Guard and commercial ships, was held on the ground by the elements seemingly conspiring against successful termination of the hunt. Tip after tip and clew after clew have been run down by the searchers since the hunt began Friday night. From the lips of ranchers and motorists these clews have come. One after another, they have been eliminated. The final tip resulting in a concentration of searching parties in the Topa-Topa region convinced heads of the parties that the wreckage of the fallen ship, and perhaps a grewsome complement, awaited them there. Perhaps the most efficient force of searchers yet banded together, a party headed by a veteran woodsman, was composed of ranchers guided by an Indian, Tony Arajo. This party based at the Cuddy Ranch in Lockwood Valley. A caterpillar tractor and grader will be used to open a road to the scene of the tragedy if the ship is located, if this is necessary, Sheriff's officers said. The great army of searchers was augmented late Saturday by reinforcements numbering among their forces hunters and fishermen, soldiers and civilians, all offering their aid. The area covered by the large body of hunters is a mountainous one, wild and for the most part impenetrable. It is rated by veteran airmen the most treacherous region between the Southland and the northern Pacific Coast States. 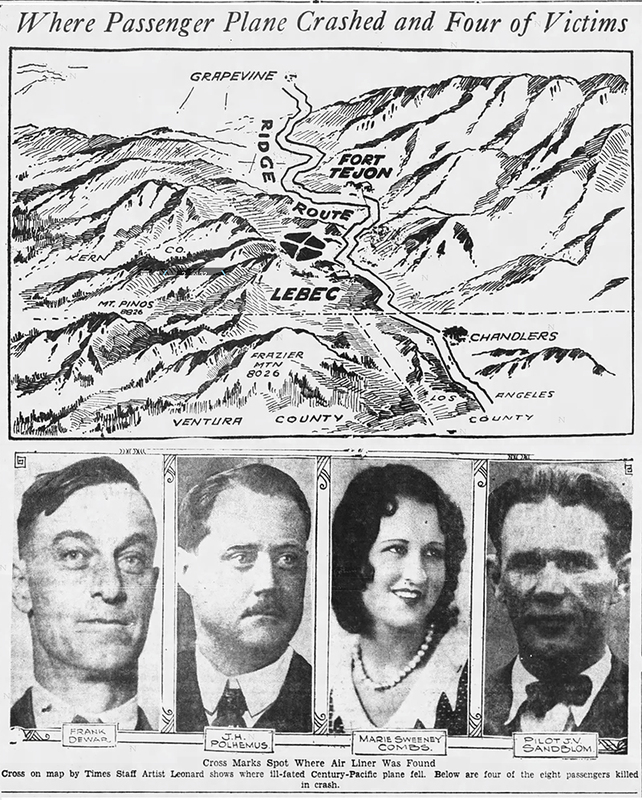 The tip sending the searchers into the Lockwood Valley district was so convincing that from Lebec, far to the north, Department of Commerce Inspector Brewster and picked squads of mountain men trekked to the region where the Tifft family reported they saw the green-and-gold ship falter and crash. Caterpillar tractors added their thundering weight to the caravan of hunters trekking over the almost impassable region of the hunt last night. Crew after crew of valiant searchers, undeterred by realization that the ship's occupants cannot be alive, have ventured into the recesses of the Lockwood Valley area, where the liner is reported to have wavered in her course and fallen. Snow and a cruel wind have sent these searchers back, defeated. The "burning shack" reported to have been seen by a passing pilot late Friday, located in this Lockwood district, gave promise of being the wreckage of the fallen liner. Theories that the aircraft had missed her course and fallen at sea were discarded. Veteran pilots pointed out that Pilot Sandblom, a veteran of more than 4,500 hours in the air, would not have missed his course to this extent. A reward of $1,000 has been posted by O.R. Fuller, president of the Century-Pacific, for information leading to recovery of the lost ship. Sandbergs in Los Angeles county was the scene last night of a great concentration of searchers. Sheriff Treager, with Sheriffs Clark of Ventura county and Walser of Kern county, headed a meeting of hunters who apportioned horses to riders and snowshoes to foot searchers. Police of outlying substations, including Fairfax and Altadena, aided in the Council. The more than two score officers, sixteen of whom were motor patrolmen assigned to assist the Sheriff in his search by Capt. Cannon, head of the county motor patrol, were under the direct supervision of Stensland of the Sheriff's office. Stensland assigned details of men to traverse by foot the rugged terrain and to travel over every road and all territory accessible with automobiles. Both Sheriff Traeger and Stensland placed much credence in the report that the plane may have gone down in the Camarillo district, the pilot either deliberately making toward the coast when he encountered fog over the Ridge Route or losing his way and unknowingly heading in that direction because of poor visibility. With Alamo Mountain as the focal point, the eager ships standing "on the line" at several airports will take off at the earliest possible moment in the hunt. A story supporting that of young Tifft was told searchers by Tom Cuddy, 15 years of age. living in Cuddy Valley, near the Tifft home. This lad said he saw the transport ship at an altitude of about 300 feet turn into a box canyon in Lockwood Valley. Airmen said such a move would result disastrously, as a plane could not climb out of such a trap without crashing. Searching parties attempting to get through to the canyon described were mired in their automobiles and forced back. Only an aerial survey will determine whether the plane fell there, searchers said. 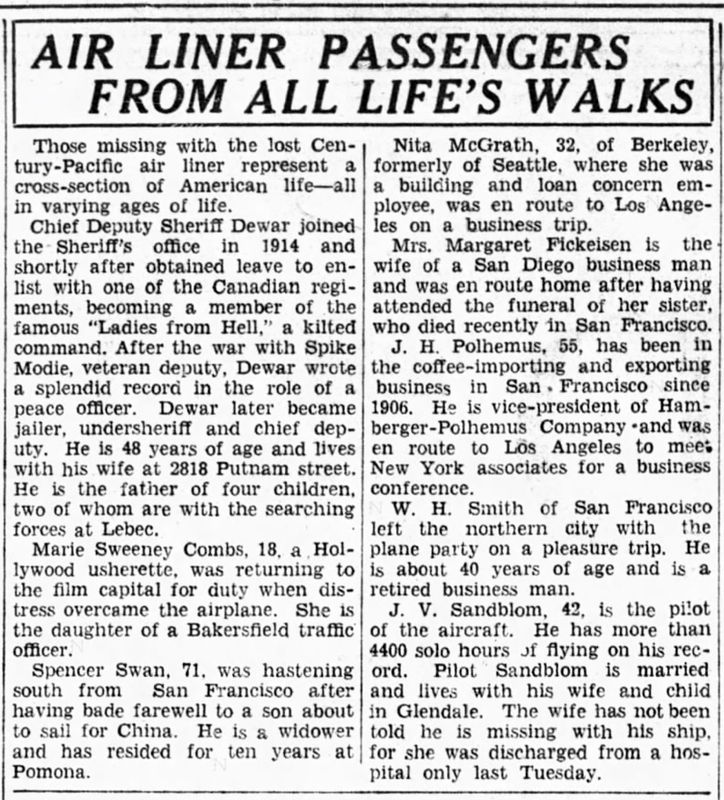 In addition to Chief Deputy Sheriff Dewar, the lost ship bore Pilot Sandblom; Marie Sweeney Combs, 18, Hollywood; Nita McGrath, 32, Bakersfield; Mrs. Marguerite Fickeisen, San Diego; Spencer Swan, 71, Pomona; J.H. Polhemus, 65, San Francisco; and W.H. Smith, 40, San Francisco. A narrow escape from being the first sacrifice of the hunt was experienced by E.W. Whiting yesterday when his plane crashed in a field beside the Ridge Route four miles north of San Fernando. Fog forced Whiting down and his plane was wrecked. An appeal for snowshoes was made late last night by the State Highway Patrol, members of which formed a party led by Indian guides and penetrated into the wilderness of snow and rugged peaks where the missing liner is thought to have fallen. The snowshoes, the official appeal stated, are badly needed and anyone wishing to aid should call WEstmore 3141 and ask for Mr. Bruck. Los Angeles Times | Tuesday, February 2, 1932. 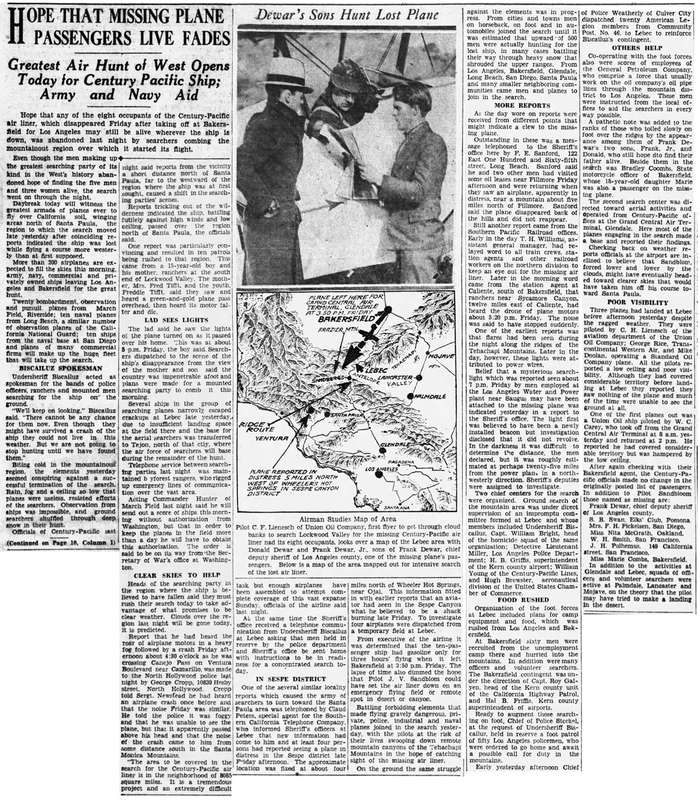 While searchers for the missing Century-Pacific air liner, which vanished from sight with eight occupants on a Bakersfield-to-Los Angeles flight last Friday, prepared last night to investigate the most convincing report yet received as to the lost ship's location, fears were expressed throughout the State for the safety of two army flyers believed down in the region that claimed the air-liner as a victim. The second ship, an army bomber, is believed down within the radius now being combed for trace of the Century-Pacific trimotored craft. The army plane left Glendale early yesterday for Crissy Field, San Francisco, and at a late hour last night was unreported at any major or emergency landing field between the two cities. In the army ship are Lieuts. Edward D. Hoffman and C.A. Cocke. Lieut. Hoffman is reported to have been on leave and attempting to locate the missing air liner when his service plane dropped from sight. The report being investigated by searchers for the lost air liner when the news of the army ship's disappearance startled the army of hunters, was one provided by two men who said they saw and heard the Century-Pacific plane pass over and crash on Cobblestone Mountain, approximately thirty miles north and east of Santa Paula and close to the Los Angeles-Ventura county line. The report was given first by James Herbert, 3411½ Larga avenue, a driver for a local lumber firm. Herbert said he saw a sudden blaze on Cobblestone Mountain, about two-thirds of the distance to the peak of the mountain, at about 5 p.m. Friday, a time which veteran airmen say would place the lost ship in this region. Herbert said the blaze shot up suddenly, then died out as quickly, and aviators expressed belief it was a gasoline fire. Herbert's report was substantiated last night by the report of United States Forest Ranger W.P. Ecersoll, who said he saw a plane similar to the missing liner circling over this mountain at the same time Friday. Eversoll [sic;?] said the ship was circling as though attempting a landing there. Herbert was taken to the scene late yesterday and from a vantage point at the National Forest Inn, where he was unloading lumber at the time he said he saw the blaze, pointed out the scene of the fire to Deputy Sheriffs Contreras and Cloud. The officers, reporting their findings to Capt. Bright of the Sheriff's homicide detail later, aroused the first enthusiasm yet shown in the Sheriff's office. Capt. Bright said the clew was the best yet received and ventured the opinion that it will result in finding of the lost ship. Mounted parties of searchers were to start out at dawn today for the scene, while airplanes will soar over the region, guided by the truck driver. Herbert, who will be equipped with a portable radio transmitting set for the purpose of giving the pilots their directions. Defeated at every turn by snow, ice, low-hanging clouds and freezing temperature, searchers on the ground and in the skies were compelled to mark time last night, while the passing hours, with a steady snowfall, made their chances for finding the fallen plane more remote. More than a foot of snow fell early yesterday throughout virtually all of the area of the search. This white blanket, aviators and ground men pointed out, makes doubly hard the work of locating the liner, particularly if the craft burned. Freezing temperatures prevailing throughout the area insure lengthy duration of the concealing mantle shrouding the fate of the ship and its three women and five men occupants, including Chief Deputy Sheriff Frank Dewar. Half a dozen aviators dared the treacherous clouds and sudden down drafts swirling above the mountainous territory embracing the search area yesterday. The flyers were beaten back to their base at Bakersfield by the wintry blasts after short and fruitless flights. The persistently inclement weather held a fleet of more than 100 planes, held in readiness at three bases, on the ground and blacked the efforts of the many searching parties mounted and afoot at the scene of the search. A call for snowshoes by the hunters resulted in dozens of pairs of the shoes being rushed to the area of the search by Los Angeles stores and Hollywood studios. Sheriff Traeger, feeling keenly the possibility of the loss of his veteran chief deputy, Dewar, left for Sandberg's, one of the bases of the hunt early yesterday, while Undersheriff Biscailuz left later in the day for the same point to aid in organizing the hunt. While three days had passed since the liner disappeared, Mrs. Dewar, wife of the missing officer, bravely announced last night that she holds the highest hopes for the safe return of her husband. "I have every hope that he will come out of it safely," she said. "I am keeping the garage door open for him. I expect to hear his automobile turn into the drive very soon, now. It cannot be that he is gone." Century-Pacific officials viewed the incessant snowfall with misgivings. They regard the weather conditions as impassable barriers that may delay findings of the lost ship until winter ends in the region, pointing out that the high altitude of the area will prevent a breaking up of the grip of ice and snow clutching the district. Even the valleys in which searching parties believe the ship to have fallen are above 3,000 feet in altitude, while the mountains which may have claimed the craft as a victim are as high as 9,000 feet, maps show. A group of 100 men under leadership of Sheriff Walser of Kern county and State Highway Inspector Snell began combing the region west of Lebec, the apex of a triangle also formed by Fillmore and Ojai. Capt. Casey Jones and a squad of thirty picked men arrived last night at Quail Lake, near Frazier Mountain, equipped with bob sleds, flare guns and everything necessary for a prolonged stay in the snowbound region. The party, which left Los Angeles early yesterday, will establish a base for a plane with which they will press the search. Another party of forty men was headed by Sheriff Clark of Ventura county and headed for Santa Paula Peak, while still another, composed of eight Indians of the Tejon ranchos and a dozen veteran woodsmen under Forest Ranger P.S. Sprague, worked into the Mutau Flats district north of Sespe. Spence Turner, a county forester, headed another band of forty searchers, completely outfitted for a long stay in the wilderness, to hunt in the Quail Lake region between Snow and Pine mountains. Turner's party is equipped with pack mules, horses, snowshoes, a caterpillar tractor and field telephones. The group will string a telephone line after them as they fight their way into the wild and almost impenetrable country. This party, it was said at headquarters of the hunt on the Cuddy ranch, at the foot of Frazier Mountain, is the best equipped one in the field. Other smaller groups combed various districts in the area, chiefly in the Lockwood Valley region and the vicinity of Sespe. No report, however far-fetched, has been ignored by the searchers to date. Each clew was run down, regardless of its nature. No hope was held last night by the searchers that any of the occupants of the ship will be found alive, so cold has the weather ben since the craft disappeared. The weather forecast for the area of the search is for continued snow and rain, with poor visibility. A tragic note was given the developments last night when Chief Deputy Sheriff Vance Brite of Ventura county disclosed that Dewar, a few minutes before boarding the ill-fated plane at Bakersfield, confided to him that he had a premonition of impending disaster and hesitated before climbing in. Dewar was anxious about weather reports and told Brite, the officer said, of a "narrow squeak" he experienced recently while flying to Phoenix. Dewar and Brite together investigated reports that three men sought m the "Zeke" Caress kidnaping case were at Button Willows [Buttonwillow], near Bakersfield, and Dewar was returning from the hunt by plane Friday. T.J. Yerby, owner of a resort near the field headquarters, was pressed into service teaching the hunters how to manage their snowshoes. Rain that fell in the valleys while snow was whirling about the mountains froze as soon as it fell, creating a coating of ice on the roads and stalling automobiles. A plea was made yesterday for horses. The searchers asked Dr. Harry Furlopp, Cuddy Valley rancher, for mounts and were given them. Aboard the plane when it took off from Bakersfield were, besides Dewar, the pilot, J.V. Sandblom, 42 years of age, of Los Angeles; Miss Marie S. Combs, 18, Hollywood; Spencer Swan, 71, Pomona: Miss Nita McGrath, 32, Berkeley; Mrs. Margaret Fickeisen. San Diego; J.H. Polhemus, 55, San Francisco; and W.H. Smith, 40, also of San Francisco. Members of the Pomona Elks' Service Club yesterday offered silent prayer for the safety of Swan, a charter member of the club. Swan was flying to Los Angeles to meet his son, Joe E. Swan, a Shanghai (China) banker. The son had flown from New York to take ship for China and the father, who was in San Francisco, hastened to meet him before the boat sailed. Los Angeles Times | Wednesday, February 3, 1932. Death and mystery rode the air trails of California yesterday as hundreds of searchers in two areas sought two missing planes and nine persons who vanished with them, and in another district the wreckage of yet another ship was found beside the charred body of its pilot. In the wild Tehachepi region north of Los Angeles a veritable army of hunters on the ground and in the skies penetrated into a wilderness of snow and ice in search of the Century-Pacific air liner NC10815 [sic: NC10813], missing with eight occupants since last Friday. Farther northward another body of searchers sought traces of an army observation plane that vanished Monday with Lieut. Edward D. Hoffman of Crissy Field, San Francisco, at the controls, near Fresno. 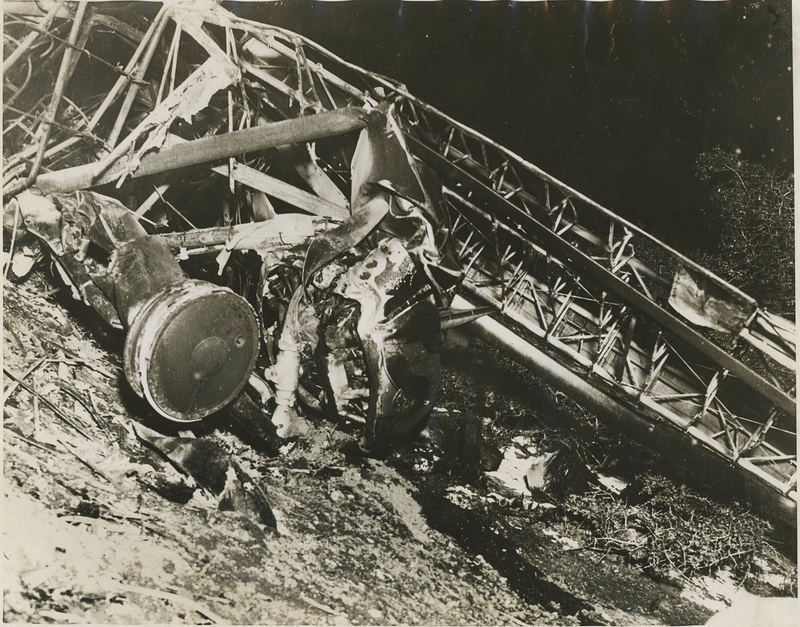 Even farther to the north flying men came upon the body of a veteran air-mail pilot, John W. Sharpnack, burned beyond recognition, and the wreckage of his burned ship which crashed late Monday night in the vicinity of Rio Vista. Sixty pursuit and bombing planes, taking advantage of what promises to be the first clear day since the hunt for the Century-Pacific plane began, will leave March Field, Riverside, after daybreak today to search for both the missing liner and the army plane, Col. Henry H. Arnold, commanding officer at the field, said last night. This aerial force, upon which the searchers depend to locate the missing craft, will be augmented by a great fleet of other aircraft now held in readiness at many points between Los Angeles and San Francisco for the hunt. Developments in the search for the Century-Pacific plane yesterday were plentiful, with many clews furnished the bands of hunters in the ice-locked region where the liner is believed down. The most credible report to find its way into headquarters of the search was that of Capt. Jones of the Sheriff's office, who, with a party of hunters, saw evidence of a plane crash on the north side of Frazier Mountain, one of the northernmost points in the area of the frenzied quest for the missing liner. Capt. Jones reported seeing a wide swath on the mountainside, a strip apparently sheered by a falling ship, and wreckage at the bottom of a canyon halfway up the side of the mountain. The heavy fall of snow that has made the search doubly difficult prevented officers from definitely ascertaining the nature of the wreckage. A blizzard forced the party away from the scene. An earlier report, which electrified the hunters, was checked out and said to be without foundation. This was the story of two men that they had seen wreckage of a plane in Elizabeth Canyon, near Red Mountain. This area is far to the east of the main search. What the men saw, Sheriff's officers reported later, was a burned shack. Another report which was to have been checked this morning was that of Pilot E.L. Benway of the Century-Pacific Line that he had seen a great flock of buzzards circling about a region near Piru Creek, in Modelo Canyon. A strip of terrain evidently was shaved off, the flyer said, with trees broken off close to the ground. The buzzards were circling over this area, Benway reported. The aviator said visibility was so poor and snow drifts were so high that he could not determine if any wreckage was on the ground. Pilot Merle Nelson of the Texaco Company reported seeing five people in a canyon ten miles south of Neenach, while flying over that region early yesterday. The five waved frantically to him, Nelson said, indicating they wanted him to fly farther into the canyon. A blizzard raging in the canyon prevented him from attempting such a flight and Nelson was forced to seek a landing place elsewhere, he said. Headquarters for the search for the Century-Pacific plane was established last night at Sandberg's, where Sheriff Traeger and Undersheriff Biscailuz maintained contact with Sheriff Clark of Ventura and Sheriff Walser of Kern counties, State Highway Patrol and county officials. A government weather forecast bureau also was established at the headquarters. The weather in the area of the search cleared partially yesterday, for the first time since the hunt began, and for two hours the huge fleet of aircraft available for the quest were able to soar over the district. More than eighty flights were made out of Los Angeles, while countless flights were recorded in Bakersfleld, at the Kern County Airport, and at other points where the 200 planes are based. Col. Roscoe Turner, veteran pilot, flew into the Lockwood Valley region, where it was at first believed the liner fell, and a Western Air Express ship penetrated to Frazier Mountain, where the Sheriff s offices were attracted by its circling and reported finding wreckage in the canyon. The report of Daniel Emmett, Santa Paula Assemblyman, that he saw the liner in the vicinity of Grapevine Mountain on the day the ship vanished, also will be investigated thoroughly today, it was said at the headquarters of the hunt. Several motorists have reported seeing flares on Cummings Mountain late Friday. This also will be checked early today. This region is far to the east of the area of the search to date. A reward of $500 was posted with Sherlff Walser yesterday by heads of the Pacific Coast Coffee Company of San Francisco, of which J. Polhemus, one of the missing liner's occupants, is an official, for information leading to finding of the craft. The Sheriff yesterday asked for radio broadcasts for aid in the search. The army plane believed down in the region of the Sequoia National Park bore Lieut. William A. Cocke Jr., also of Crissy Field, as passenger in addition to Lieut. Hoffman, its pilot. Cocke made a parachute leap from Los Angeles Monday. He did this, he told rangers who found him yesterday, to lighten the plane, upon which he was [illegible], forcing it down. The plane vanished into a raging blizzard after Cocke jumped, he said. Reports last night indicated Hoffmnn headed the ship north from where Cocke made the parachute jump. Five army planes last night were sent from Crissy Field to Visalia, near where the plane is believed down, to begin a search for it today. The ship's motor was heard at noon Monday, less than an hour after Cocke's jump, over the north fork of the Kaweah River, north of where the leap was made by the officer. Veteran flyers, after examining the wreckage of the air mall plane near Rio Vista in which Pilot Sharpnack met death, expressed belief that the crash occurred when Sharpnack was en rotue from Oakland to Salt Lake City with 300 pounds of mail when he crashed and burned. The mail was destroyed. Los Angeles Times | Thursday, February 4, 1932. Belief that the wreckage of the Century-Pacific airliner missing since last Friday with eight persons aboard will be disclosed by another dawn near Caliente, in Kern county, was expressed last night by searchers completing the fifth day of their quest for the lost ship, which vanished en route from Bakersfield to Glendale. A veritable flood of reports made by miners, women motorists and an Indian, all saying they distinctly saw the plane crash into a grove of trees near Caliente, reached searchers at Bakersfield and Los Angeles last night. The reports were delayed since last Friday by weather conditions which made travel out of the Caliente district impossible until yesterday, the miners, women and the Indian said. The Indian, who gave only the name Dave, made the trek into Caliente on foot and was highly excited when making his report. The location described by the Indian places the scene of the crash a short distance from the Kernville Road, eight miles northeast of Caliente. The Indian said he saw the faltering plane crash into some trees, bounce high into the air and settle down beyond the grove. The report of the miners, employed in the Amalie Mine, about twenty-seven miles east of Bakersfield and near Caliente, indicated the crash occurred in approximately the same vicinity. The report was carried to Bakersfield by Stephen Reiss, owner of the mine. Reiss said he was unable to get out of the district embracing his mine until the weather opened yesterday. The time of the crash fixed by Rein and the Indian was 4:30 p.m. Firday. The women, whose identities were not made known in Los Angeles last night, fixed the time and place similarly. At the time the reports were received, faith in the efficacy of the huge fleet of aircraft made available for the great search had fallen. The more than 150 planes working out of the several bases in the hunt had taken advantage yesterday of the first clear day of the quest and had combed an area of about 250 square miles, without sighting a trace of the lost liner. Dawn today was to find a large portion of the vast force of searchers heading for the Caliente district, with planes aiding them out of Los Angeles, Bakersfield and other bases. A party of hunters at Caliente was ordered to the Amalie mine last night. They were to deploy and search the region where the Indian, miners and women said they saw the crash. The searching party was expected to be on the scene of what is believed to have been the crash at daylight. It is the belief of veteran flyers, in the face of the new reports, that Pilot J.V. Sandblom of the ill-starred liner was attempting to head back for Bakersfield after finding passes to the southeast of Bakersfield closed by thick weather. Officials of the line say the reports, if they are accurate as at first believed, indicate the pilot attempted to break through passes in the Tehachapi Mountains south and east of Bakersfield, and, finding them impassable, turned to the north and east, attempting to head back to the port he had left. The reports of the several persons at Caliente were the most convincing yet received, heads of searching parties said. The vicinity to be combed this morning has not yet been touched by the vast fleet of planes and ground searchers. Every available bit of equipment on hand at Bakersfield and Los Angeles will be dispatched to the newest sector at dawn, officials of the Century-Pacific Line said. The scene of the crash, if found to have occurred where the reports indicate, is twenty-seven miles east of Bakersfield and ninety-five miles northwest of Las Angeles, by airline. The reports from Caliente were relayed to Century-Pacific officials in Los Angeles by Bob Trow, dispatched by the Los Angeles office of the line to aid in the search in the vicinity of the Tehachapi Mountains. From three search headquarters parties of hunters prepared to leave last night to investigate the Caliente clew. At Bakersfield Sheriff Walser of Kern county headed a large group of well equipped searchers planning to leave before daybreak for the Caliente region. At Lebec inspector Snell of the State Highway Police equipped a crew of his men and several deputies with everything necessary for the search, including railroad flares which will be used to guide airplanes above the territory to the scene of the crash should it be found. At Sandbergs, main headquarters of search, Undersheriff Biscailuz equipped Capt. Hanby and Deputy Sheriff Rodenmayer with outfits for a similar trek and ordered them to leave before dawn for the scene of the latest clew. Clew alter clew had been investigated and exploded during the day yesterday before the Caliente reports came in. Ship after ship returned to their bases, discouraged pilots and observers shaking their heads. It was felt by searchers that only ground crews, equipped with snowshoes and supplies for long treks into the wild country traversed by the air line between Bakersfield and Los Angeles, can hope to locate the lost craft. Snow that has fallen incessantly since the hunt began is believed to have covered the wreckage, making it virtually impossible for airmen to find the twisted mass that may have resulted from a crash. Ground men said it may even be possible that man on snowshoes may pass over the wreckage if the high snow drifts have covered it. Veteran flyers point out that in most cases of ships crashing in snowy regions only folk on the ground have made discoveries. After a day of fruitless searching through the Sierras in the vicinity of Sequoia National Park for traces of a fallen army bombing plane and its officer-pilot, more than three-score pursuit and bombing ships settled down at their base at March Field, Riverside, last night, their pilots and observers holding but faint hope for Lieut. Edward D. Hoffman. Hoffman, a Crissy Field pilot, vanished last Monday in the large plane. Hoffman, with Lieut. William A. Cocke, Jr., also of Crissy Field, was flying from Griffith Park to the San Francisco army field when his plane struck a blizzard over the national park. Cocke made a parachute leap to safety and the bomber disappeared into the storm. Cocke made the jump, he said when found Tuesday, to lighten the ship, which was being coated with ice in the storm, and give Hoffman a chance to gain altitude. At a meeting of the Professional Pilots' Association. members of which are among the many flyers aiding in the search for the lost Century-Pacific liner, a protest was lodged yesterday against the flood of false reports which have sent pilots on fruitless quests since the search for the liner began five days ago. "It is the desire of the association,'' a report made public last night stated, "to inform all radio stations and newspapers that pilots will appreciate co-operation in preventing the general public from giving false reports and misleading clews regarding the lost ship, as such reports endanger the lives of those aboard the ship if they escaped death in the landing. "Hundreds of pilots are searching for the lost liner. It is necessary for them to fly at low altitudes making it impossible for them to land a ship without crashing, in running down reports. Thousands of dollars are being spent, in addition to vast effort, and co-operation on the part of the public is needed also." Los Angeles Times | Friday, February 5, 1932. The seared and crumpled wreckage of the trimotored Century-Pacific air liner which vanished a week ago en route from Bakersfield to Los Angeles with eight persons, including three women and Chief Deputy Sheriff Frank Dewar aboard, was found yesterday four miles northwest of Lebec, the broken and horribly charred bodies of its cargo of human beings huddled in a gruesome mass in and near the remnants of its cabin. Discovery of the wreckage and the eight corpses was made shortly after 2 p.m. by Paul Apodaca [sic], a rider of the Tejon Ranch, on the north side of Johnson's Canyon. The scene of the tragic end of the fleet ship and its occupants is approximately eighty miles northwest of Los Angeles. The snow-filled canyon of tragedy is situated almost at the extreme top of the Ridge Route, about three miles south and west of old Fort Tejon. The ill-starred liner's occupants on its fated trip last Friday were, besides Dewar, Pilot J.V. Sandblom, 42 years of age, Glendale; Spencer B. Swan, 71, retired capitalist, Pomona; Marie Combs, 18, of Hollywood and 2318 Nile street, Bakersfield; Mrs. P.H. Fickeisen, 20, 4451 Maryland street, San Diego; Miss Nita McGrath, 32, Berkeley; J.H. Polhemus, 56, San Francisco; and W.H. Smith, 40, also of San Francisco. The rider Appodaca, an Indian familiar with virtually all of the wild country in the vicinity of the crash, was led to the grewsome find by three shepherd dogs accompanying him in his search through the canyons of the region. Searchers led to the scene of the tragedy by Appodaca saw heaped in the forward end of what had been the liners cabin a charred mass of bodies. One body lay outside the ship, near the tip of the craft's left wing. A wedding ring found on one finger showed that it was that of Mrs. Fickeisen. Only the face of this victim showed signs of the gasoline blaze that had made a crematory of the fallen liner. The woman's olive drab topcoat and a string of gold beads about her throat were untouched by flames. Her hat and shoes were missing, evidently having been torn from her when she hurtled from the liner's cabin at the instant of the crash. A book, "Buried Treasure," lay open between Mrs. Fickeisen's body and the wreckage of the cabin, indicating she had been reading at the moment the doomed plane struck. The plane's three 250-horsepower motors were not deeply imbedded in the ground, and the framework of the fuselage, wings and tail surfaces were not twisted enough to indicate a nose-first, vertical dive of the craft to the earth. Supposition of airmen arriving later at the scene was that the ship skidded a short distance on its undercarriage before nosing into the canyon wall. The plane needed but about ten feet more in altitude to clear the ridge forming the top of the wall, the flyers said. This clearance would have enabled the craft to reach the low plains of the San Joaquin Valley in safety. While several feet of snow was lying against the slope of the canyon's wall where the plane struck after its fatal cometing, no snow covered the wreckage. The position of the seared metal framework of the craft showed that it lay on its undercarriage, right side up, after it struck against the earth. Indications all pointed to the fact that none of the occupants had an opportunity to open even a cabin door or attempt to leap. The fact that a blaze followed immediately after the crash showed veteran airmen on the scene after the discovery that Pilot Sandblom had no warning of impending disaster and was fighting the ship's descent by use of its controls when the terrific crash occurred. The flyer, a veteran of more than 4,000 hours in the air, would have cut off the ship's ignition had he such warning, they pointed out. Had the ignition been shut off there would have been little chance for the gasoline, cascading out of the shattered tanks, catching fire, they said. Physical evidence at the scene pointed to the fact that Sandblom, flying "blind" in a raging blizzard and faced with little hope of getting through on his southward course, had attempted to turn back to Bakersfield when death struck at the harassed ship under his guidance. The fact that the liner crashed into the north wall of the canyon indicated plainly that it was not on a southerly course but was being swung northward at the time of the disaster. The 45-year-old Indian Appodaca, coming upon the grewsome sight against the bleak canyon wall, surveyed the scene for a moment, and then began mushing his way back to Old Fort Tejon, whence he had started on his quest. Two miles from the scene, he encountered R.E. Bedwell, San Bernardino member of the State Fish and Game Commission, who was working out of Fort Tejon under orders of the Los Angeles office of the commission. With Bedwell were two deputies also engaged in hunting down the lost ship. Appodaca returned to the scene of the crash with the three men and afterward all returned to report the discovery at the fort. "Go back from Fort Tejon to Johnson's Canyon. It is near the head of the canyon, on the north side, close to the top. The ship is burned." It required several hours for Appodaca and his companions confirming his discovery to get to the fort after leaving the scene of the crash, so heavy were snow drifts in the region. At the Dewar home, when news of the fatal crash reached her, Mrs. Dewar, widow of the widely known chief deputy, became prostrated with grief and was placed in bed. Last night she was under the care of her sister, Mrs. Margaret Palladine, and Dewar's daughter by a former marriage, Mrs. Helen Hedges. The Dewars' 8-year-old daughter, Peggy, was told that her father was dead and placed in the care of neighbors until the mother's recovery. When the report reached Grand Central Airport at Glendale, where the offices of the Century-Pacific line is located, a sister ship to the wrecked craft was immediately serviced and, bearing Robert Cantwell, assistant general manager of the line and several others, it took off for the vicinity of the wreck. At the scene of the crash last night Department of Commerce Inspector Hugh Brewster, who had been actively engaged in the seven-day search for the liner since it disappeared, took charge. He and a party of searchers were guided to the scene by a huge fire lighted by Appodaca and Bedwell before they left to make their report. Kern County Coroner House was dispatched from Bakersfield when word reached there the wreck had been located. An inquest was to have been conducted at the scene upon his arrival there. Pilot Sandblom was not far off his course when he attempted to turn back to his starting point, location of the scene of the crash showed. The possibility was seen by those viewing the wreckage that the victims found inside the plane who did not die from the force of the crash were burned to death in the fierce blaze that followed. Following the inquest the bodies are to be taken to Lebec or Bakersfield by deputy sheriffs under Sheriff Walser of Kern county. Chief Deputy Sheriff Frank Dewar first became identified with the Sheriff's office in 1914 and has served with distinction. Shortly after the outbreak of the World War he obtained leave of absence and went to Canada, where he enlisted and became a member of the Scotch regiment which became known as the "Ladies From Hell." His war record was outstanding. Following the Armistice he returned to Los Angeles and resumed his career as a law-enforcement officer. From deputy, Dewar was promoted to jailer, then to undersheriff, and later was appointed chief deputy assigned to special anti-gangster duty. He was married and lived at 2818 Putnam street. He leaves his widow, four children, Frank, Jr., Donald, Peggy and Helen. J.H. Polhemus, 55, was vice-president of the Hamberger [cq] & Polhemus Importing and Exporting Company of San Francisco. He had been thus engaged in the Bay City since 1906 and was flying to Los Angeles for an important business conference. He was married and the father of four children. Spencer Swan was 71 and a resident of Pomona. He was a widower and had been a resident of the Southland for ten years, having come from New York, where he was for many years a contractor. He had flown to San Francisco where he expected to meet his son, Joseph, a New York banker, on the eve of his departure for the Orient. Instead the son came to Los Angeles and the elder Swan was returning to this city when the tragedy occurred. Nita McGrath, 32, formerly lived at 2129 Ashby avenue, Berkeley, but had been employed by a building and loan company at Seattle for several years. She was en route to Los Angeles on a business trip when she met her death. Her mother is Mrs. Mary McGrath and she had two brothers, Alfred and Frank McGrath, both members of the Berkeley Fire Department. She was unmarried. Marie Sweeney Combs, 18, who had been employed as usherette in a Hollywood theater, was returning to this city from a visit with her mother, Mrs. Bradley Combs. Her address in this city was 6228 De Longpre avenue. Mrs. Margaret Fickeisen [cq], wife of a San Diego business man, was returning to her home after having attended the funeral of a sister in San Francisco. W.H. Smith, 41, of San Francisco, was retired from the United States Army in 1927 because of physical disability. He was making a pleasure flight through the Southland. The pilot, J.V. Sandblom, was 42 years of age and was regarded by airmen as one of the most capable pilots in the country. He had flown more than 4,400 hours and was one of the first pilots engaged by the Century-Pacific Line when it began operations last July. He lived at 1315 West Eighty-first street with his wife and 9-year-old daughter Helen. LW3288: 9600 dpi jpeg from original photograph purchased 2018 by Leon Worden.